They say women often marry men similar to their fathers. I’m not sure if that’s entirely true for me, but my husband and my dad do have some similar traits. My dad, for example, has always been interested in the weather and used technology to track it. My husband was only interested in the weather with regards to how it affected his commute until he figured out he could use technology to share his misery. A couple of weeks ago, he drove home in an ice storm. By the time he parked his car in our garage, it was caked in ice. 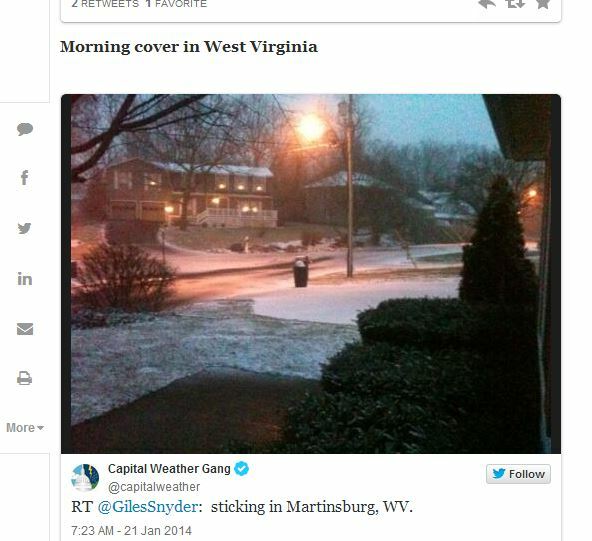 He tweeted his photo to the Capital Weather Gang, which retweeted his photo. 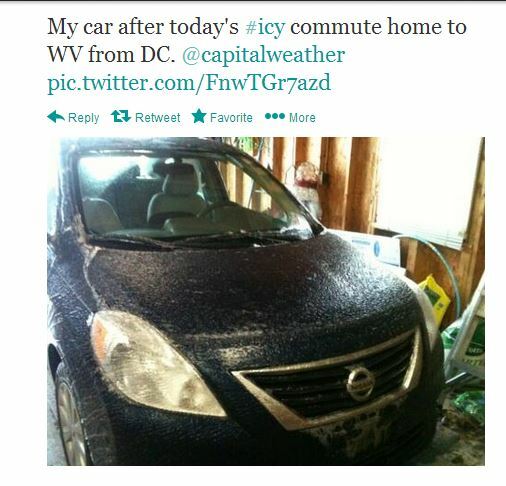 An AccuWeather employee then asked permission to post the photo on the weather service’s website. That got my husband hooked. When he got home from work yesterday morning, he was taking photos and tweeting them before the snow had even begun to accumulate. His new obsession simply makes me smile. Posted on January 22, 2014, in Family, My life, perspective and tagged 365 reasons to smile, Family, fathers, husbands, musings, People, relationships, smiles, technology, Thoughts, weather. Bookmark the permalink. 20 Comments.